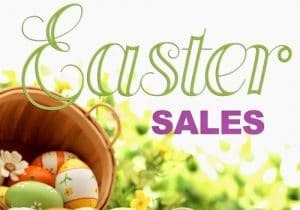 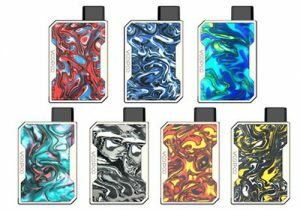 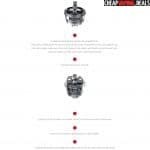 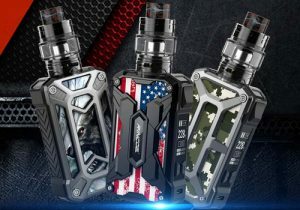 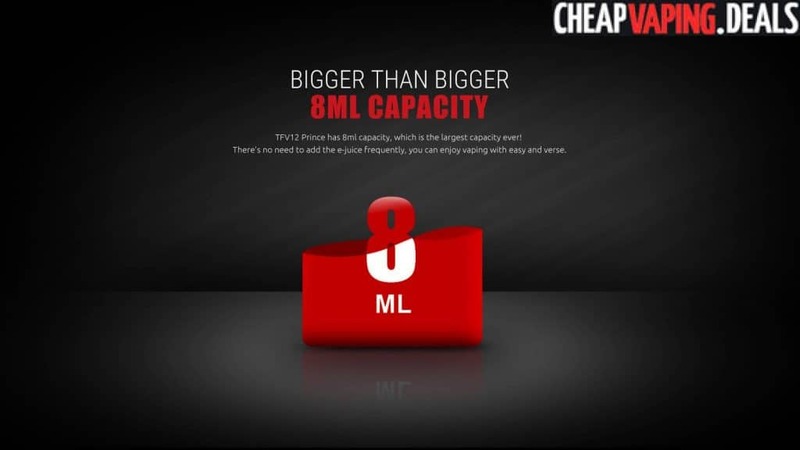 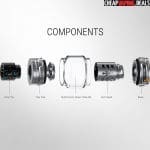 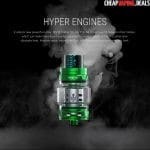 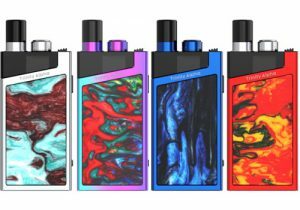 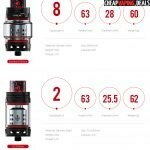 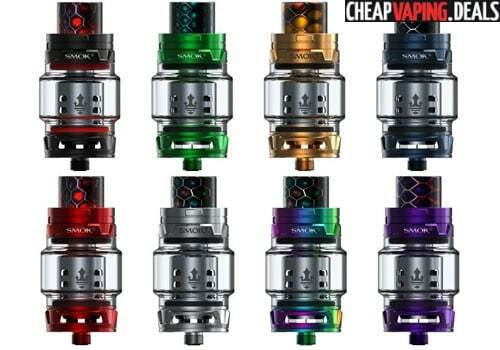 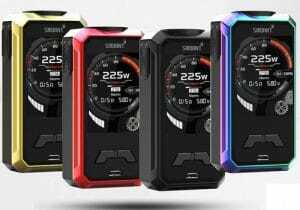 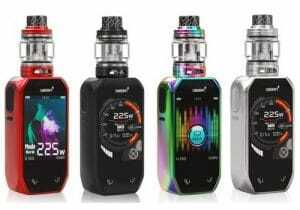 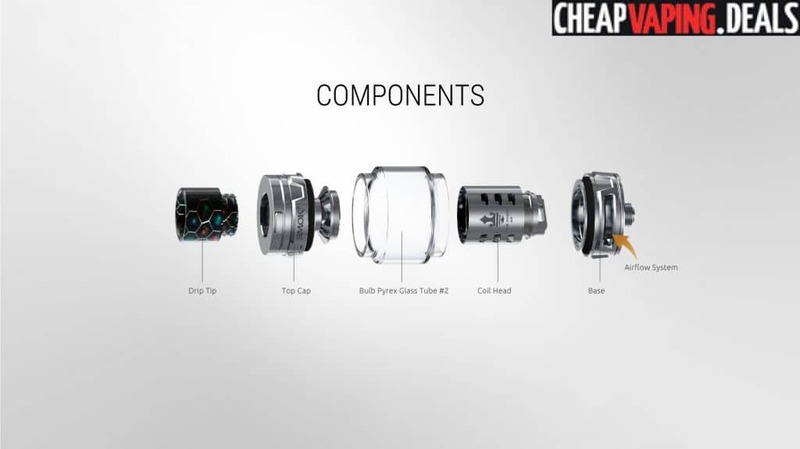 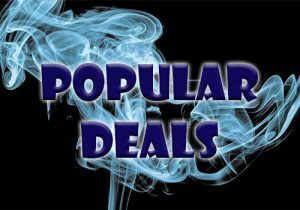 Check out this cheap deals for the Smok TFV12 Prince Tank. 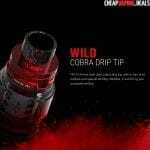 It features massive vapor output, mid to high wattage coils, a patented locking mechanism for the top fill system, a cobra drip tip and a massive 8ml tank capacity thanks to the new convex glass tube. 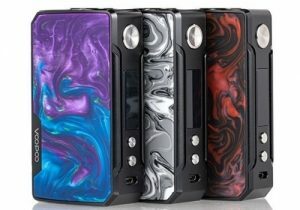 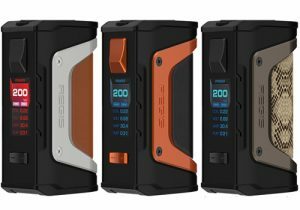 Design-wise, the chassis has adopted a crown-style form factor and available colors include black, green, gold, blue, red, silver, 7-color and purple. 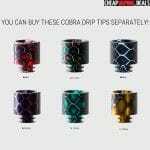 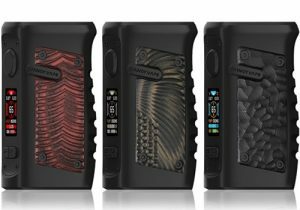 The appearance also incorporates cobra drip tips that feature an amazing snake skin pattern and are available in many optional colors. 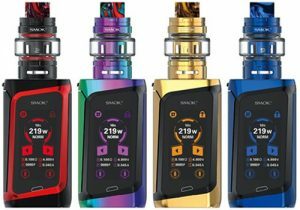 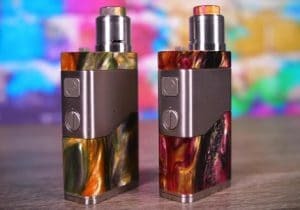 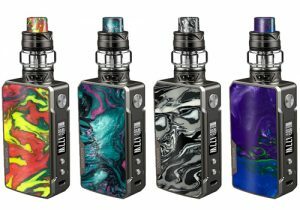 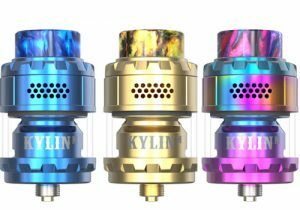 There are two editions of the tank available: the standard one measures 28mm x 63mm, weighs 60g and is built with a bulb shaped (convex) glass tank which results in an e-juice capacity of a whopping 8ml. 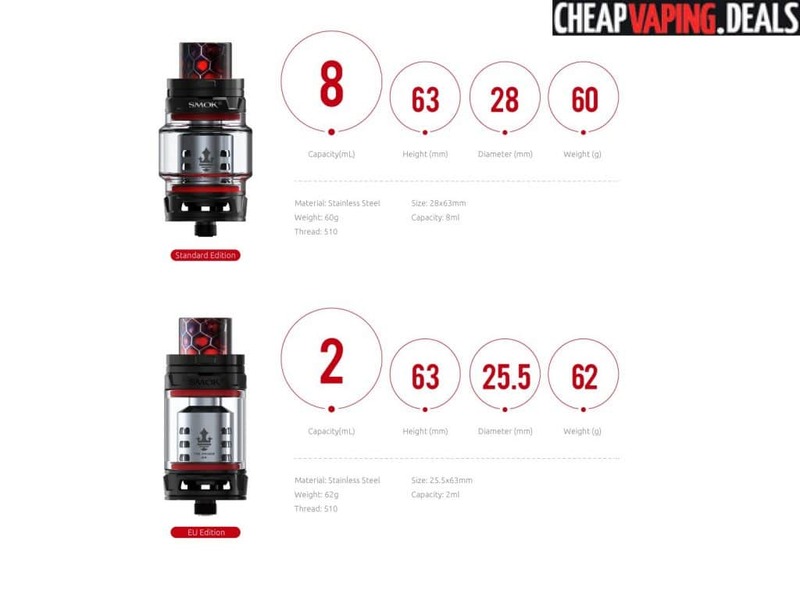 For those who live in the European Union, where there are suffocating regulations, you will receive the EU version that only holds 2ml, weighs 62g and measures 25.5mm x 63mm. 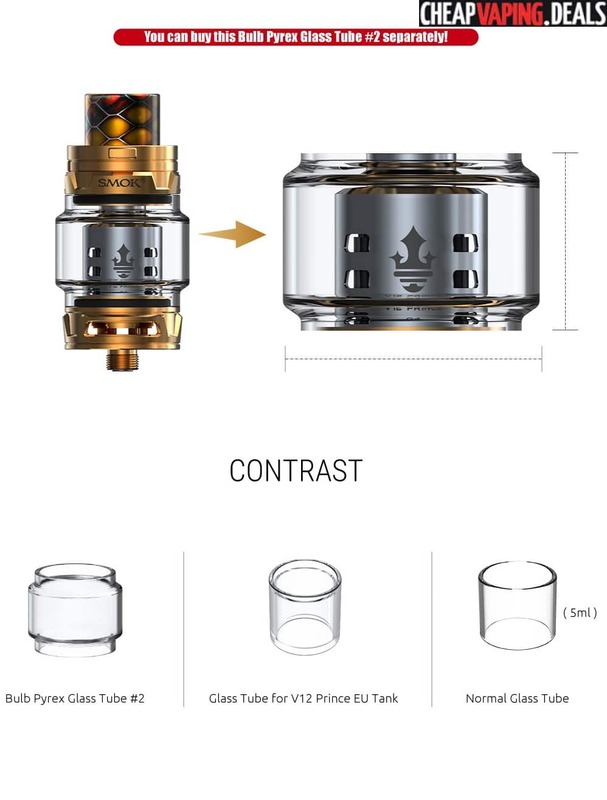 This new tank is built with the same top fill system that allows the top cap to rotate on a hinge to expose a fill port. 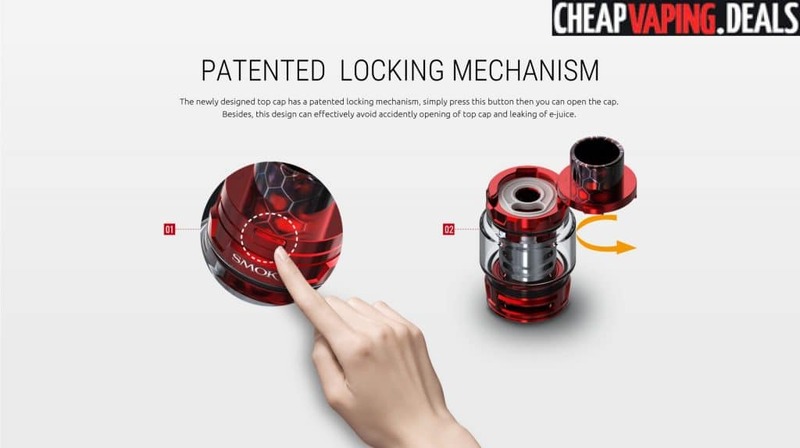 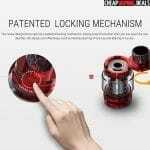 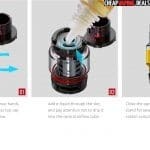 But, to prevent accidental opening and leakage, the setup has been enhanced with a patented lock system that involves a simple press of a button to open the top cap. 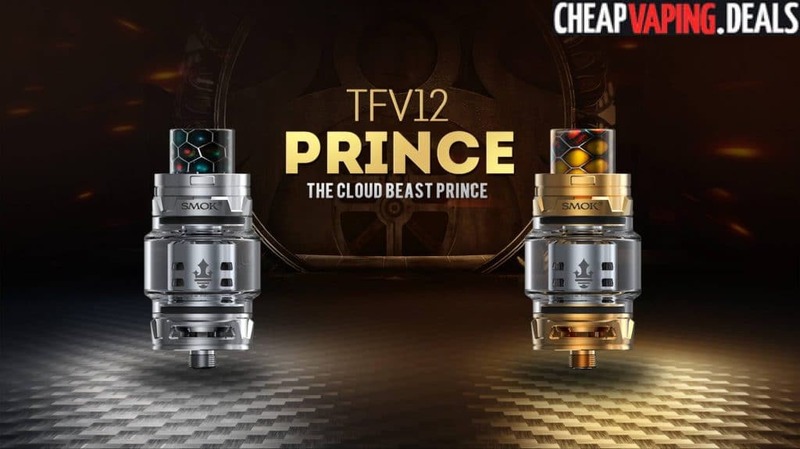 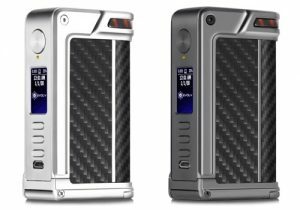 The Smok TFV12 Prince utilizes a brand new coil system. 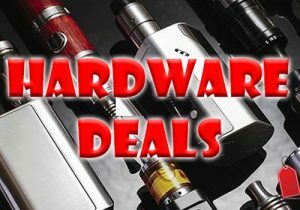 With purchase, you will receive the latest Q4, X6 and T10 coils that are all designed to produce massive vapor clouds with amazing flavor. 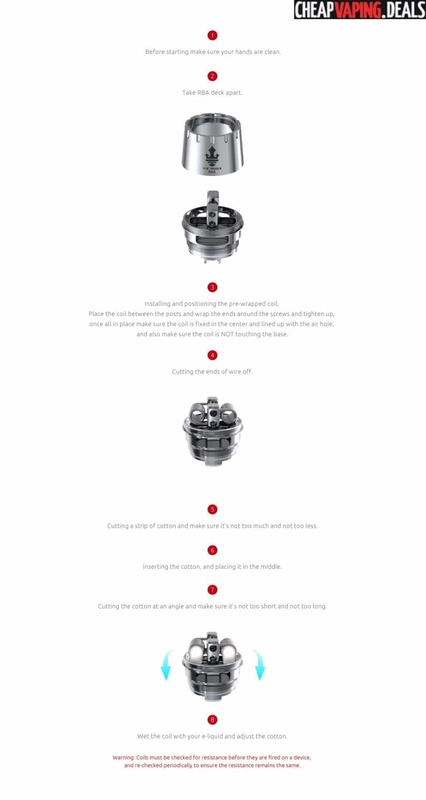 These cores are all built with 12 wicking slots to quickly saturate the cotton while dissipating heat. 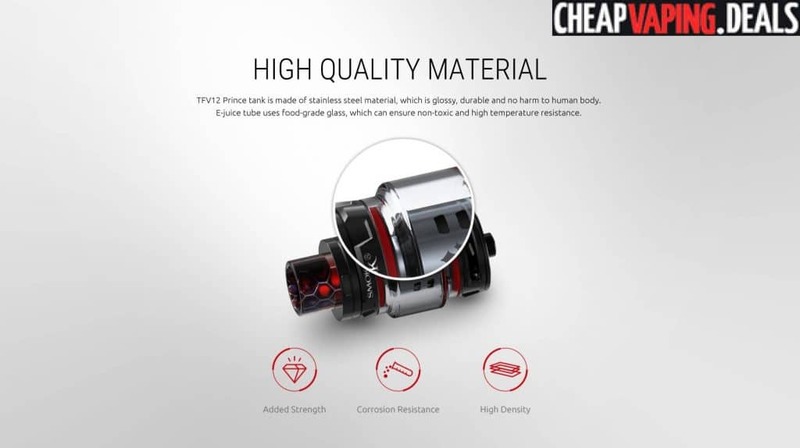 The included 0.4ohm Quad Coils V12 Prince Q4 core has a power range from 40 to 100 watts, but should be used between 60 and 80 watts for best performance. 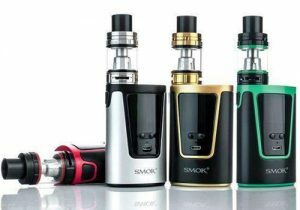 It produces rich deep vapor clouds. 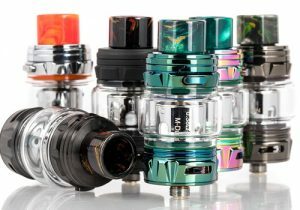 The included 0.15ohm Sextuple Coils V12 Prince X6 can be fired from 50 to 120 watts, but is best between 80 and 100 watts. 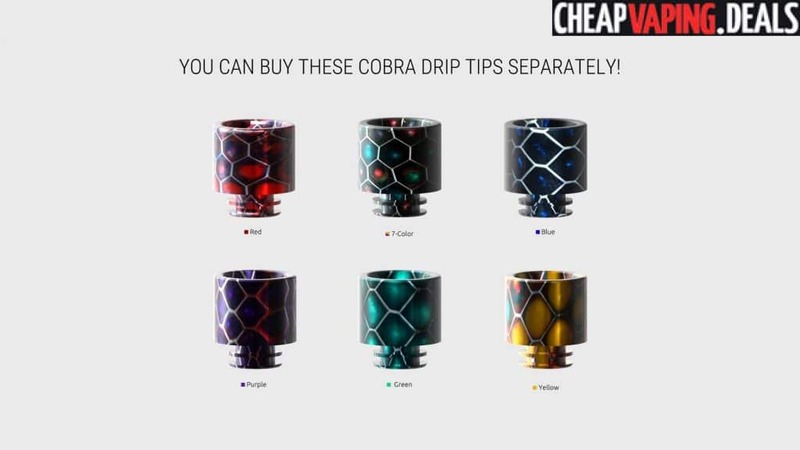 It puts out huge vapor with a silky taste. 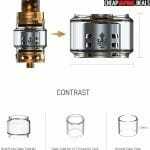 The included 0.12ohm Decuple Coils Prince T-10 fires in the range of 60 to 120 watts, but is recommeneded 80 and 110 watts. 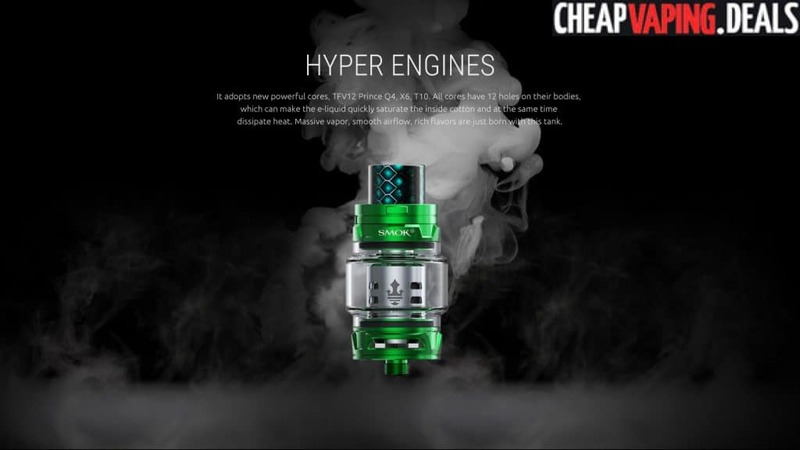 It results in massive vapor and rich flavor. 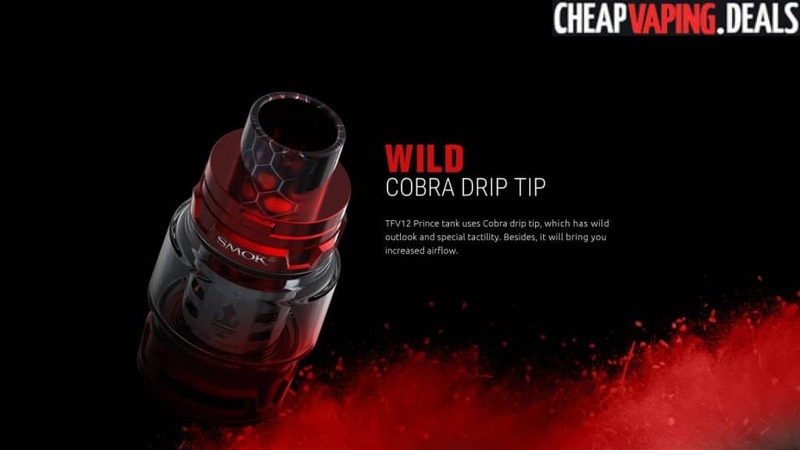 The optional 0.17ohm Quad Coils Prince M4 has an output capability from 30 to 70 watts, but is recommended for use from 45 and 55 watts. It is said to work best with mechanical mods and produces rich clouds with silky flavor. 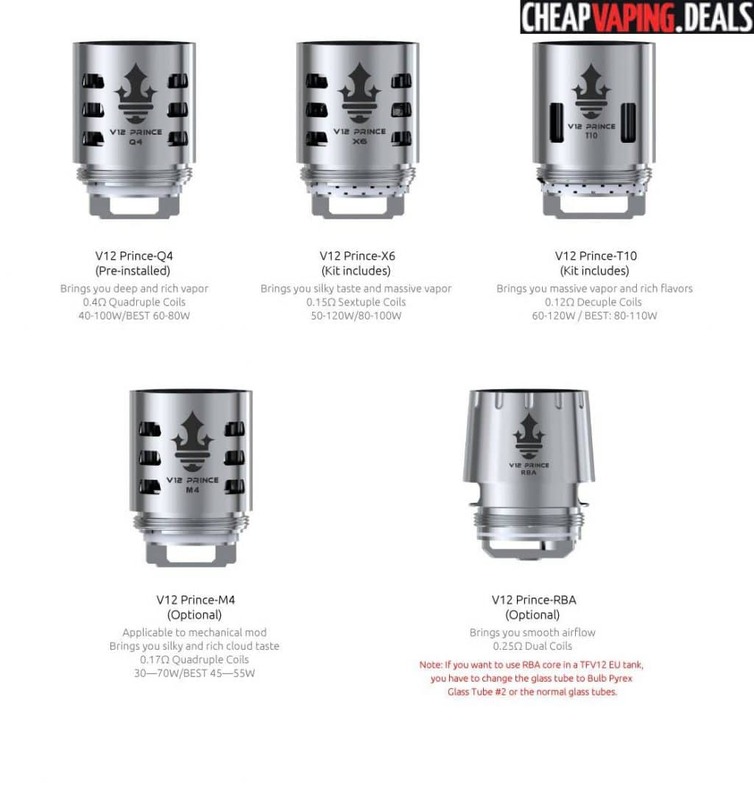 The optional 0.25ohm V12 Prince RBA is perfect for those who enjoy coil building. 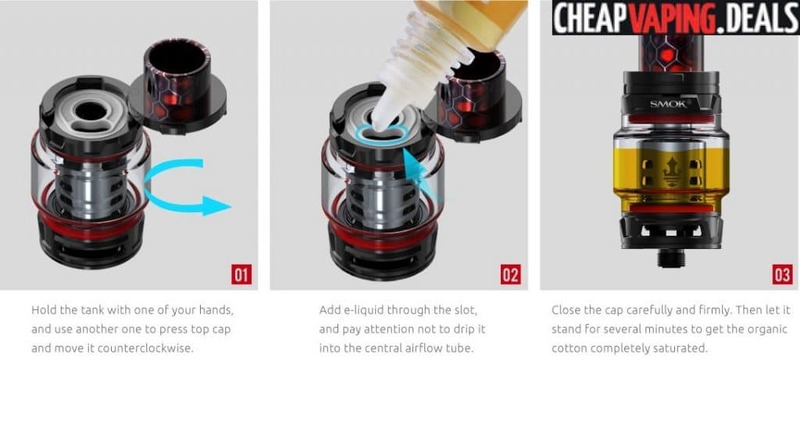 It provides smooth airflow. 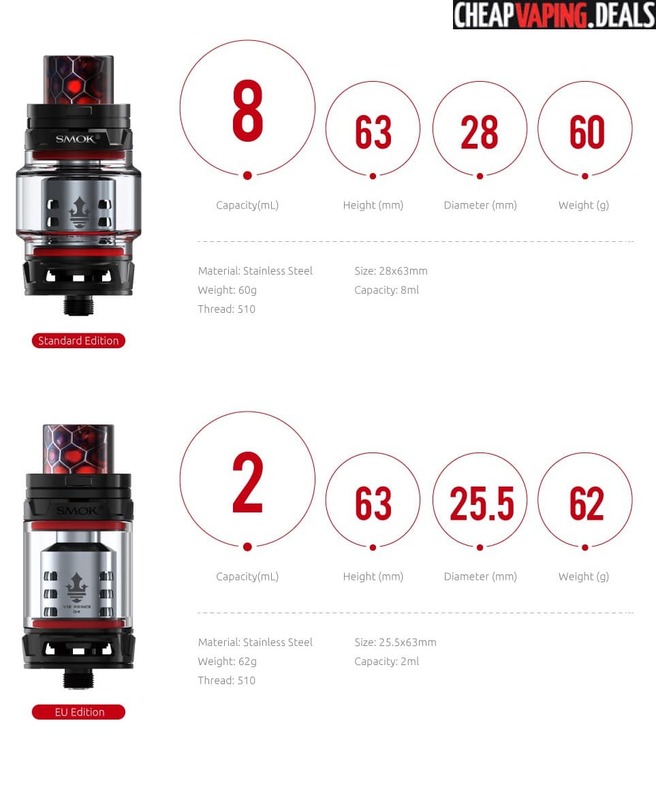 Airflow on the Smok TFV12 Prince looks to be the same. 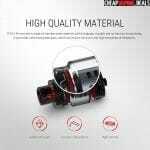 But, like its predecessor, this device has massive dual airflow airflow intakes that are built with an easily adjustable mechanism. 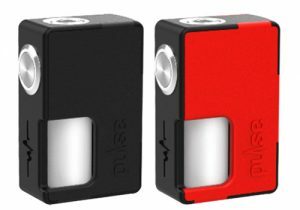 The air slots are easily set from all the way closed to wide open or anywhere in between.